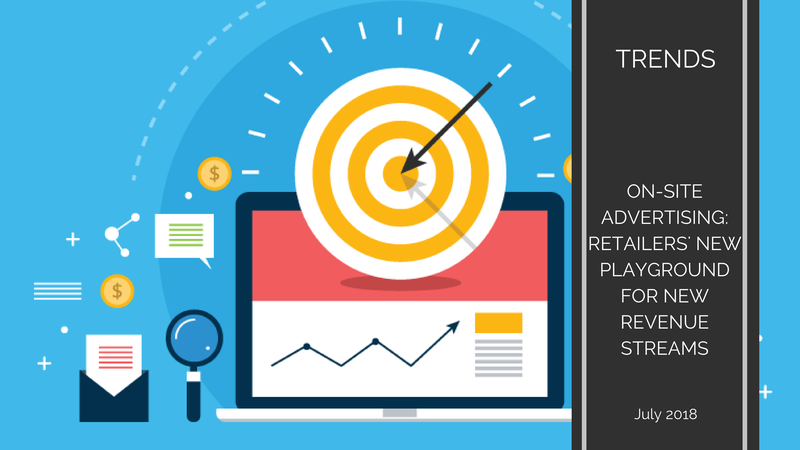 Looking for new revenue streams through new services and business models, Retailers turn to e-merchandising monetization with new advertising solutions. If this trend occurred as early as 2016 with the launch of Amazon Media or the acquisition of HookLogic by Criteo – replacing the traditional banner (existing before 2016) and its lack of relevance for advertisers as well as website visitors, it seems to now become a smarter must-have for any Retailer which wants to increase revenues. And the place-to-be for any brand which wants to win the search battle, strengthen its online exposure and increase its sales. Retailers websites and apps — particularly Amazon — are increasingly a starting point for shoppers’ product searches. A 2016 BloomReach study showed that 55% of online product searches start directly on Amazon, compared to 28% that begin on a traditional search engine like Google or Bing. This new way of traffic monetization intiated by the online behemoth, it raises an opportunity for retailers to think about monetizing their web pages and apps to publishers in order to provide both a more accurate and personalized experience to customers and generate new revenue streams. Some leading retailers, among which Macy’s, Target, Walmart and Staples, push more relevant native ads enabling brands to reach out to shoppers based on real-time shopper data. Those big names of retail uses HookLogic. The NYC-based startup (bought by Criteo in 2016 for $250M) is the first platform to offer the capability to know how ads effectively drive sales. Brands displayed on the retailer ecommerce website or app can bid on ads, which are dynamically generated regarding existing retailer 1st-party data (ie. data the retailer collects directly from its customers: email address, purchase history…). As a result, the brand winning the auction appears in-feed on the ecommerce website or in-app. Retailers neither negotiate nor even know who’s paying them unless they want to look at the product listings on their sites. For example, Nespresso has used HookLogic to buy inventory on Macys.com to drive traffic to their online shop on Macys.com, which enables Nespresso to improve its conversion rate and Macy’s to secure its current traffic and offer a more personalized customer experience. Brands (ie. Nespresso) pay to bid on those ads, with HookLogic splitting the revenue with ecommerce sites (ie. Macy’s) and publishers (ie. Nespresso), thanks to its post-click attribution technology. Post-click attribution consists in crediting the sales to the last click on an ad a customer did to buy. This model is useful for companies that offers a large slection of products while better targeting each user based on its interests. It however ignores all of the interactions that may influence the purchase decision before clicking on the ad. Regarding the limits of the attribution model, measuring the incremental revenue can be meaningful to identify whether the ad campaign causes the customers to convert. In other words, incrementality is the measure of the lift that advertising spend provides to the conversion rate. To measure it, advertisers need to compare how they currently allocate spend to target known users to holdout groups. These holdout groups are composed of users who don’t see retargeted ads. This allows advertisers to compare purchase rates of users who were shown retargeted ads to the control group of users who weren’t shown retargeted ads. Understanding incrementality allows advertisers to optimize their ad budgets by allocating retargeting ad spend in the most impactful way possible. Measuring incrementality allows advertisers to see which groups of users should receive increased retargeting spend, because groups with higher incremental lift are those that need an additional “push” through the sales funnel. Groups of users that have lower incremental lift have a greater likelihood of having purchased regardless of seeing an ad. By understanding this full user pathway, advertisers can better optimize where they spend their retargeting dollars. On the consumer side, it offers a seamless and user-friendly experience as content integrates smoothly in-feed (what we call a “native ad”). In addition, using real-time shopper data to serve product ads enables to “push” relevant content to each shopper. On the retailer side, it drives traffic on product detailed pages and thus positively impact conversion rate and transactional revenue, as the purchase funnel is shorten while suggesting product(s) earlier in the funnel: for instance, on the Home Page or Category Page. In addition, at a time of fierce online competition, this Retail-as-a-Service technology presents a new source of revenue, monetizing website traffic via cost per click-based native ads. On the brand side, it enables to drive the best performance, yielding very high click through rates and a direct path to driving a sale. However, it is important to wonder how much incremental benefit vs. cost did the brand has derived from the media. Is HookLogic the sole player on this market? Actually, HookLogic solution has been integrated into Criteo’s performance marketing portfolio when it was acquired in 2016 by the French company. For the latter, the acquisition enabled to expand its marketing business to brands manufacturers thanks to HookLogic clients portfolio, to provide additional expertise for enhancing existing products and to build more elaborated performance marketing products. Hooklogic’s main competitors are actors like Hivewyre or Diablo Media. Of course, ecommerce giant Amazon offers its own solution of “Product Display Ads”, accessible via Amazon Marketing Services. It links publishers’ ad to an Amazon product detailed page and enables to target their competitor’s products. Publishers can choose between product targeting (if they want to focus a narrow group of shoppers) or interest-based marketing targeting (if they want to build the brand and reach more customers). However, as a Retailer, contrary to Criteo-HookLogic solution, Amazon’s “Product Display Ads” does not help to monetize its proprietary website traffic, but only does it allow to give more product visbility and shorten the purchasing funnel. As ecommerce grows more important, Retailers should seize the opportunity to turn their ecommerce website into a media property, in order to strenghten their online presence and increase their revenues.